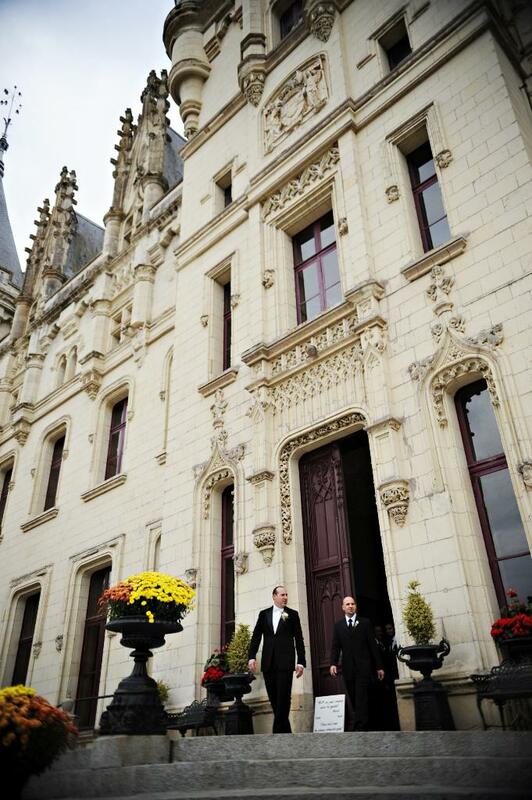 A silver screen worthy wedding at Chateau de Challain in Loire Valley, France (http://www.chateauchallain.com/). Old Hollywood Glamour took center stage at this intimate soiree. A subtle color palette of creams and soft golds and plush textures intermixed with vintage details conjured the Hollywood spirit. I have always had a love affair with France. So, having the benefit of knowing me from the youthful age of 13, it was no surprise to my now husband (James) that, if I were to marry, it must be in France. I could think of no better way to celebrate our love affair (which began as a friendship in high school 16 years prior – James is the ultimate procrastinator), than to host an intimate week-long celebration with our closest friends and family members in our favorite destination – to share what we love with those who we love most. We envisioned a unique, vintage glamorous fête that celebrated our long (and at times long-distance) love affair. One that harkened our guests back to the golden age of travel and silver screen magic. For the ceremony, I wore a vintage bombshell cut Ulla Maija (purchased at half-price from SF Saks' Bridal sample sale), complete with feather embellished Rene Caovilla (purchased for $50! from a sample sale). A birdcage veil with feathers along with estate jewelry completed the ensemble. Bridesmaids wore a vintage black dress of their choice, paired with vintage rhinestone earrings that I gave them as a thank you. We kept the guys classic in tuxes. The groom was dapper in an Armani tux and bow tie that we purchased on sale at Neiman Marcus (In my humble opinion, every grown-up man should own a tux – so our wedding was the perfect excuse to stock my husband's closet with a tux). Hollywood Glamour permeated the reception - an abundance of candlelight, cream flowers donning feathers and classic crystal and silver serving ware. Each dinner setting included a gold box, topped with a vintage rhinestone broach (for some sparkle), holding a caramel treat from the famed Paris gourmand Fouchon. Vintage love letters were incorporated throughout the reception – menus sealed like love letters addressed to each guest, vintage French postcards served as table numbers and guests were asked to send a message to the couple via provided postcards. A traditional French wedding cake (a tower of caramelized cream puffs) was served, as well a a Michelin worthy menu of foie gras, filet mignon and puff pastry topped scallops. The town church's stately architecture was the perfect setting for the ceremony. The vintage love letter theme continued with programs styled after vintage postcards. Vintage feathers from the 1920s and rhinestone shoe buckles were incorporated into the bouquets, and the church pews were minimally decorated to add a soft texture to balance the stone architecture. Knowing how far our guests had traveled, each guest was greeted at the Chateau with a travel "necessity kit" addressed to them in our own handwriting, containing monogrammed soap, regional postcards and jams, water and snacks. A week of celebratory outings included bike rides along the wine route, absinthe distillery tours, an excursion to Mont St. Michelle, cocktail parties and gourmet dining. Guests were entertained at the reception with a cartoonist, martini bar, DJ, fireworks and an after hours dessert bar. The party continued into the morning. For our first dance ('La Vie en Rose' by Edith Piaf), I changed into a Cymbeline Paris dress scored at a sample sale. For those who know me, they find my costume change to be hysterical because, at the outset, I protested against wearing a wedding dress. Booking Chateau de Challain was a leap of faith, for we had never visited the Chateau in person and, at the time, there were limited reviews about the Chateau. But, we knew that we had made a great choice when the Chateau was subsequently featured on MTV. The proprietor, Cynthia Nicholson, is an American woman, so coordinating the logistics was rather seamless and Cynthia executed our vision flawlessly. Holding a destination wedding relieved a bit of the stress associated with weddings because it required us to let go of some control - to bend with the wind. It may be a surprise, but it was also significantly cheaper to hold a destination wedding with our closest 30+ friends and family than to have a 200+ wedding Stateside...total budget was under $20,000. Designer Wedding Dress at Discount: Nearly every bridal store and designer holds a sample sale at least once a year. Monique Lhuillier's is in downtown LA, and well worth the trip. I initially purchased a Monique Lhuillier gown for $800 but then opted for a more modern design by Ulla Maija (but I kept the Rene Caovilla shoes that I found for $50). Vintage Details: Flea markets, garage sales and estate sales are excellent resources for finding affordable vintage costume jewelry. Vintage shoe buckles and broaches easily fastened to my bridesmaids' bouquets for a designer pop. Paper Ephemeral: Etsy is a great online site for scoring vintage menus, maps, postcards and other paper goods as well as custom monograms. I found a vintage map of the Loire Valley and vintage postcards of regional chateaus and enclosed copies in every guest's welcome bag. I also found blank vintage French embossed menus that I used to print the Martini bar menu and Dessert bar menu. Couture DIY Invites: Customize your wedding invitation suite with graphics from www.graphicsfairy.com, and print on high quality Italian letter press stationary paper. I used Medioevalis, available here http://www.rossi1931.com/. Enclose theme appropriate paper goods/resources, and your invites will look like they cost a fortune! Estate Jewelry: A great wedding memento - the bride's wedding jewelry. I purchased my estate necklace and earrings from Fortane in Carmel, Ca http://www.fourtane.com/. Whenever I wear these pieces, the associated memories make me smile. Affordable Welcome Bags: For $5/guest, we included vintage regional maps, vintage postcards featuring regional chateaus, regional travel size jams, monogrammed soap, travel shampoo, water, and French caramels. We reproduced the vintage maps and postcards at our local Kinkos, tied in a bundle with gold bakers twine and stamped with our wax monogram. Travel size Marseille soap was picked up on sale, wrapped in drawing paper stamped with vintage postal images and sealed with our wax monogram. We saved complimentary travel shampoos (such as L'Occitane) and French jams from our hotel stays leading up to the wedding. Water bottles and caramels were purchased from the Chateau's local grocery store. Sentiments: Personal details are the magic behind weddings. For me, it was infusing memories of my late father into the ceremony. A photo of my father was clipped to my bouquet, a memory mention was included in the programs and I walked down the aisle to his favorite song - 'Fools Rush In' by Elvis Presley (string quartet version).